A Divvy bike station on campus. NU student memberships with Divvy increased to 667 by the end of the 2016-2017 school year, according to a sustainability report released last week. Northwestern diverted about 38 percent of campus waste from landfills during the 2016-2017 academic year, according to a new sustainability report released last week. The report detailed progress NU has made in sustainNU’s program areas — the built environment, transportation, resource conservation, experiential learning and communication and engagement. NU collected nearly 10,000 pounds of food, clothing and household items to donate to charity during move-out from campus housing alone, the report said. Katie Mansur, Associated Student Government’s vice president for sustainability, said recycling opportunities during move-out periods and throughout the year help students pay attention to the things they throw away. To attain its goals, sustainNU created a five-year strategic sustainability plan released In October. The plan allowed the University to build on efforts from previous years and “pick up the pace” in some areas, said Stephanie Folk, sustainNU‘s sustainability communications manager. “The strategic plan … brings together all of the big issues and sets specific goals for where we want to get within the next five years, and looking forward a little bit too in some areas,” Folk said. 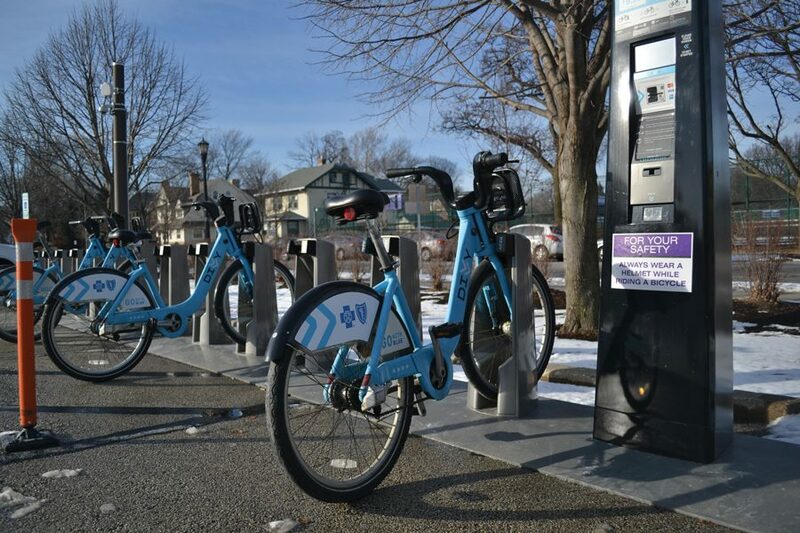 Meanwhile, Divvy bike memberships among NU students reached 667 by the end of the year. The purple, NU-branded bike — introduced to campus in Fall 2016 — took 821 trips with 640 riders for a total of 1,619 miles, the report said. The report also said the University increased its purchases of “real food” — food that is produced in a way that is fair, humane and environmentally sound — from 2 percent to 5.5 percent, with a goal of reaching 20 percent by 2020. Greenhouse gas emissions in 2016 were reduced 13 percent from the 2012 baseline, according to the report. 68 new trees were also planted on the Evanston campus, and the University used 50 percent organic-based fertilizers to maintain campus landscaping. The University conducted its first-ever waste audit, sorting through more than 9,000 pounds of waste from 19 buildings across both the Chicago and Evanston campuses. The information from the audit will be used to develop a new approach to increase recycling and composting rates, the report said. This year, sustainNU is working to implement an energy conservation policy for Facilities Management to refer to when planning projects and managing buildings, Folk said. She added that sustainNU is also working to create an energy management information system to track the University’s day-to-day utility data. Mansur said it is obvious NU is committed to giving students options for sustainable living, but that students also need to take initiative.